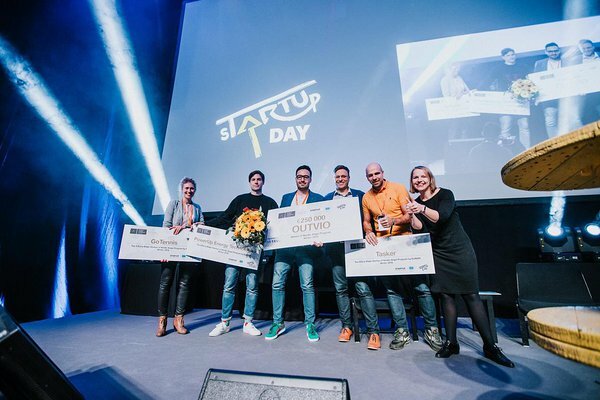 The best early stage startup was chosen on the stage of sTARTUp Day, the Baltics' largest business festival. The honour went to Outvio, which facilitates shipping and delivery of orders from small trader’s online shops. In addition to international recognition, the company receives a €250K angel investment. The investment was made by Nordic Angel Program investors. In total, 52 investors who have participated in a 3-month investors program, took part in the transaction. 127 start-ups applied for the investment from more than twenty countries. The top 15 were given the opportunity to introduce themselves to the investors more thoroughly. The winner was chosen from four finalists, these were GoTennis (Estonia), Outvio (Estonia), PowerUp Energy Technologies (Estonia) and Tasker (Lithuania). Outvio, which gained the investors’ confidence, simplifies the work of online shops by providing software for easy handling of orders and deliveries. The company’s international team has started operations on the Spanish market and plans to use the investment to expand across Europe. The President of Estonian Business Angels Network (EstBAN), Rein Lemberpuu, finds the trend that international start-ups come to Estonia to raise capital very interesting. “Candidates came from both neighbouring countries and further away, including Great Britain, which is considered the venture capital hub of Europe. We are also happy to see that local Estonian startups often have an international team and they focus on international markets, the same applies to Outvio, which won the investment. Such a number of stand-out international startups should make more wealthy individuals consider making their first angel investment. Our role as business angels is to run a thorough analysis and make the best possible decision,” he said. The Lithuanian company Tasker, which introduced itself on the sTARTUp Day stage, develops online management software for companies that manage staff whose work is mobile. GoTennis, which made it to the final, uses a simple application to connect tennis players and courts and PowerUp Energy Technologies develops hydrogen technology based electric generators for small vessels. In Estonia, the business angels’ training and investment program Nordic Angel Program is spearheaded by EstBAN. Startups and business angels have a new opportunity to apply for the program already in February and the winner will be announced at the Latitude59 festival - more information from www.estban.ee/NAP. Nordic Angel Program gives investors the opportunity to learn from experienced business angels during trainings and assessments, where both successes and failures are shared. The program also entails a study trip to the pull centre of the venture capital world to establish new contacts with other angel investors across the globe. The Nordic Angel Program is co-financed by European Commission’s Start-up Europe initiative under the Horizon 2020 programme.